A person who knows of an animal bite that caused an abrasion, scratch, puncture, tear, or piercing of the skin that causes bleeding or scratch to an individual shall report the incident or animal to the local rabies control authority, in which the animal is located, or in which the exposure occurs. Please promptly report animal bites to your local Health department & Animal Control/Police Dept. offices immediately. The owner of each domestic dog or cat shall have the animal vaccinated against rabies by four months of. The animal must receive a booster within the twelve-month interval following initial vaccination. Every domestic dog or cat must be re-vaccinated against rabies at a minimum of at least once every three years with a rabies vaccine licensed by the United States Department of Agriculture. The vaccine must be administered by a state licensed vet and according to label recommendations. Official rabies vaccination certificates shall be issued by the vaccinating veterinarian. 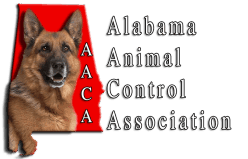 been approved by the Alabama Animal Control Association (AACA). AACA has the authority to recognize training from public or private organizations from other states, National Organizations and State Animal Control/Welfare training agencies as long as course curriculum meets minimum standards as established by AACA. These standards will be open for public comment before final adoption. A minimum of eight hours of additional training to be completed annually the curriculum to be approved by AACA as in subsection A1 of this chapter. Local governing body duly called with notice. Any locality employing an animal control officer or deputy animal control officers may appoint them as agents to inspect alleged violations of the dog and cat cruelty law, once they have received AACA certification. b. The date of the making of the record.